Commercial real estate rents are on the rise with a revenue of $1 Trillion and is growing at an annual rate of nearly 4%. Vacancy levels are at its lowest and rental growth is driving net operating income. Building owners have to understand the needs of the next generation of tenants in order to capitalize on this opportunity. The new generation of tenants demand modern workplaces combined with factors like green initiatives, sustainability with a minimal cost. They also appreciate modern and creatively designed and flexible workspaces providing the cutting-edge technologies. According to a Technation report, “High-speed connectivity remains a priority for digital tech businesses with 28% reporting digital infrastructure as a challenge”. This is a challenge for most buildings that are antiquated and are not equipped to handle the demands of the new generation of tenants. Hence renovations to old buildings are skyrocketing and generating creatively designed and modernized buildings. There are multiple drivers for this demand – 1. Younger generation and millennial workforce 2. Acceptance of global warming and climate change 3. Widely accepted green building standards 4.rising energy prices and 5.new way of working and retaining talent. Question is how can you best leverage this opportunity to attract this new generation of tenants into your building. Creative spaces are on the rise again. “The office space is becoming more of a place to host collaboration, foster culture and develop innovation and strategy. Therefore, the size of workstations has decreased, the quantity of meeting spaces has increased and it has become more important than ever that your workspace represents your organizations strategic direction.” Says Joe Lozowski, CEO of Tangram Interiors. Creative offices can mean different things to different tenants but the most important thing to remember is to include areas like open floor plans, large conference rooms, social hubs interspersed with small and quieter spaces. When it comes to real estate “Location, location, location” is the eternal mantra.Newer generation of tenants are demanding accessibility to public transportation, closer to bicycle routes and ensuring that they are not off-limits to ride-sharing options. It is also important to match the location with the type of tenants you are attracting. For examples, McDonald’s and Starbucks look for ground leases, large office of a specific sector like law firms are usually along the same area. This will help you understand your target tenant customer persona and modify your space accordingly. Most property owners are turning towards sustainability due to market demands, increased awareness of global warming and government measures towards a sustainable environment. 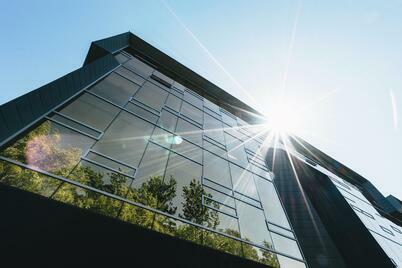 The global green building market grew in 2013 to $260 billion, including an estimated 20 percent of all new U.S. commercial real estate construction. This trend is expected to intensify in the coming years, both in the US and internationally. Sustainable buildings have a positive impact on the life cycle and operating costs of property, which is now given greater consideration by tenants than it was 10-15 years ago. Commercial building owners are investing nearly $960 billion globally on making modifications to their existing infrastructure. These include energy-efficient lighting, heating and ventilation, air-conditioning, plumbing and windows. Today’s tenants are demanding greater control and insight over their spaces. This can be made possible by implementing smart building equipment for older buildings and make the entire building “smart” for a new construction. Most buildings are also implementing smart building solutions that includes fiber-optic/wired infrastructure, automated sub-metering systems, tracking real-time occupancy and benchmarking Kilo Watt per hour (kWh) for individual tenants. Smart buildings are very helpful in tracking the energy performance, costs and energy consumption. It also provides a transparent mechanism to share these details with the tenant. The tenants would then get a clear understanding of how to lower their energy costs. Office building owners have borrowed ideas from tech startups like Facebook and Google to start offering amenities like yoga classes, massages and 15-minute meal deliveries. While tenants usually demand these amenities, they demand below-market rates that property owners have to factor into the rental charges. Amenities are very important to attract and retain high-quality tenants since it improves tenant retention and increase overall value. Easy parking and transportation, reliable hi-speed internet, dining cafes, fitness centers and some retail options are some of the things to think about as you might not be able to offer all the demands of the tenants. There are multiple ways for an ongoing engagement between the tenant and the landlords or the owners. This can be as simple as providing weekly newsletters about the various offices located in the building, improvement measures undertaken or even a new food introduced by the indoor café. Other activities that newer generation of tenants care about are recycling, updates about the green and clean measures you are implementing. You can take it a step further and involve them in monthly recycling efforts and programs that help sustainability. A new and upcoming trend is an intranet for the building. This is like a social-network for the specific building’s tenants. There is also increased use of mobile apps for the tenants of the building where tenants can make service requests or complain about security measures. “Flexibility seems to be the key word for the offices of the future because businesses are changing so fast,” says Michael Orr, architectural team leader and vice president of WorkPlaceUSA. Tenants like their facilities to grow along with their organizations, and they don't want spaces that inhibit growth. They prefer facilities that can be adjusted to fit their current and future business needs, from movable walls to build outs. For older buildings with furniture, owners can always market their space by showcasing space-planning services to customize spaces to the tenants’ needs. Computer-aided drawings make it easy to generate space plans that illustrate how the new space will look and feel. Having proper security is of utmost importance to all the tenants. Investing in security guards, CCTVs and brightly lit areas are especially important, as some tenants tend to work during off-peak daytime hours. It is helpful to emphasize on 24-hour security. Adding cameras, visitor registration, key-card access during off-work hours and an alarm system would not only attract new tenants but also help in increasing your property value. In conclusion, the needs of the new generation of tenants from the commercial space they are renting are not just cost and location. They increasing demand amenities like fitness centers, café options as well as high-speed Internet. There is an increased focus on collaborative and flexible workspaces that can be modified easily. Companies are looking to change their culture using their physical spaces. They are also using it to retain employees as well as increase employee engagement and creativity. Tenants increasingly want to be involved in greener buildings, sustainability efforts and create a communal workspace. Most of these items can be implemented in a creative manner while others will require some retrofitting efforts. Restructuring existing spaces and renovating some other spaces might put you on top of the list for this generation of tenants.